This October I sent out a survey via Facebook, Reddit, LinkedIn, and email, asking respondents about how they celebrated Halloween, including what costumes they wore, what ages they went trick-or-treating, among other questions. Trick-or-treating is the hallmark activity for kids on Halloween, where they dress up in monstrous mixtures of costumes with masks, makeup, and a miscellany of accessories, and then parade proudly through their town, hobbling up to houses, petitioning people to put candy in their bags, buckets, and baskets with the simple phrase, "Trick or treat!" However, as kids become older, "trick-or-treating" becomes less popular, as it is viewed as immature and more childlike among teenagers. When does this phenomenon occur? As part of a Halloween-themed survey I administered on Facebook, Reddit, LinkedIn, and email, individuals were asked if they celebrated Halloween, as well as when they first started and last went trick-or-treating (and if they still go trick-or-treating). The data was then repeatedly bootstrapped , randomly sampled and weighted to be proportional to United States demographics, to estimate curves describing when kids start and stop trick-or-treating. In some cases, participants put down an age range, in which case each time they were sampled, I chose an age in that range at random to use for that single simple. For the technical audience: the standard error estimates were similar to the ones I got from the survfit function from the survival package in R.
By age 4, roughly half of Americans seem to have been trick-or-treating at the time. This proportion increases until age 10-11, and then starts dropping rapidly around ages 13-14, becoming very lower after one becomes an adult. 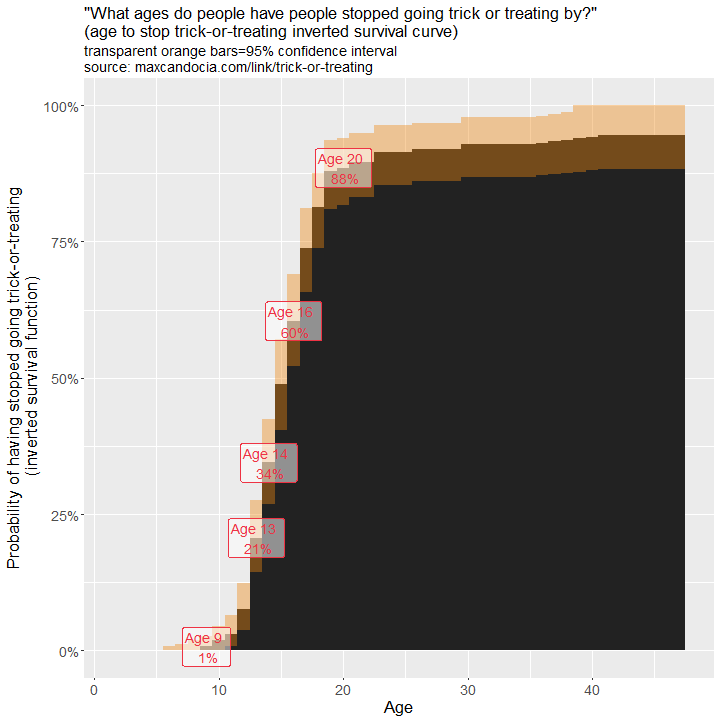 About 90-94% of all Americans (according to this survey) have trick-or-treated at least once. 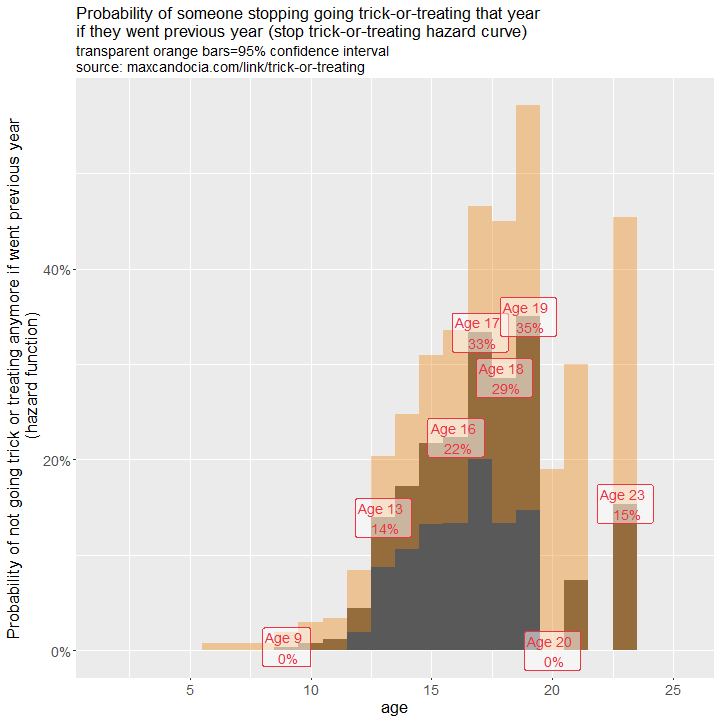 Because the sample size was not extremely large (n=268 for people who went trick-or-treating), as well as multiple responses using intervals due to imperfect memory, the margin of error of the estimates (in orange, aka "confidence intervals") is a bit large, especially for the later ages, which had fewer samples. While the above paints a good picture of the ages trick-or-treating, it also can help to look at the survival functions and hazard functions of the first/last time individuals went trick-or-treating. The survival function looks at how many individuals haven't experienced an event yet, such as how many have not yet stopped trick-or-treating, or how many have not yet begun trick-or-treating. The hazard function looks at the groups that haven't yet experienced this, and then look at what the probability is of them experiencing it for a given year. Normally these techniques are applied in pharmaceutical statistics, where one might want to see how long someone has left to live after being diagnosed with cancer, possibly comparing survival between different treatments. They are perfectly valid in any other field, though, and "survival" and "hazard" sound spooky enough to use in a Halloween setting anyway. When do kids stop trick-or-treating? Below are two different graphs. The first is the survival curve, which samples only individuals who have ever trick-or-treated. 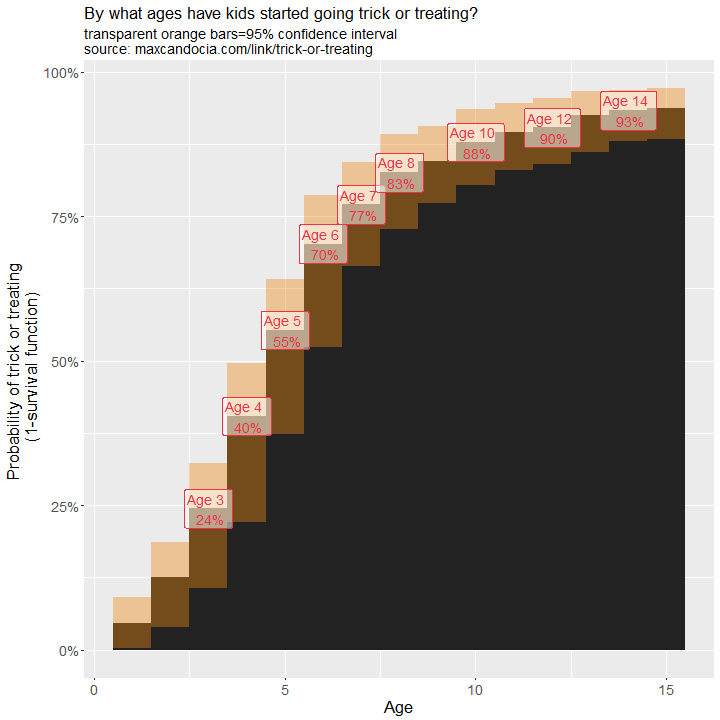 From it, you can tell which ages are major drop-offs, as the curve above doesn't take into account individuals beginning trick-or-treating at a later age. This curve is inverted (100-percent instead of percent) in order to make it easier to understand semantically. The second curve is the hazard function, and it tends to be more random (wider margin of error) than the corresponding survival curve, since it is purely based on the changes at a given age. When do kids start going trick-or-treating? Similarly, another question is when kids start going trick-or-treating. The inferences made from the below graph are about the same from the first one above, as there is not much overlap between the start curve and stop curve, age-wise. The first curve peaked at around 89%, while this one around 93%. 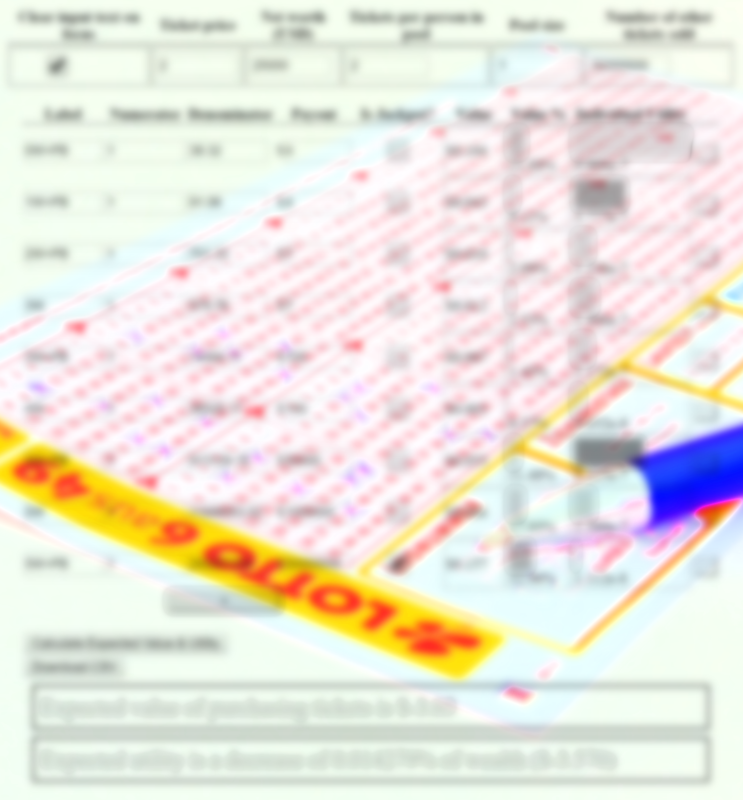 This effect is not particularly noticeable when taking into account margin of error. Although one does get a good idea of the ages at which people start/stop trick-or-treating, there is a noticeable amount of error for a lot of these figures (granted, it is a 95% interval, which isn't narrow). Perhaps more data in the future would narrow these bounds, or a greater factor could be that a lot of the age ranges are uncertain. 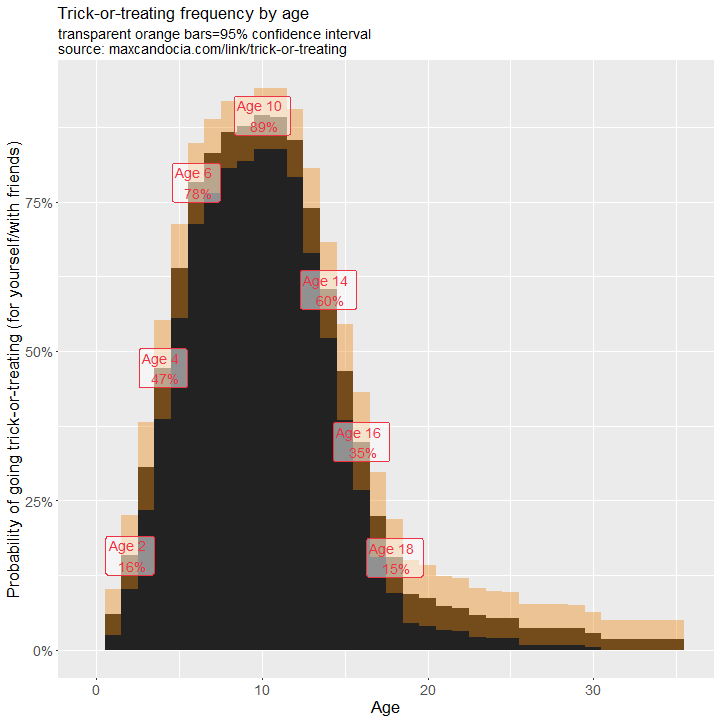 About 25% of the data had at least one uncertain age range. This is part of my 2018 Halloween survey series of articles. Currently, I have another article on Halloween costumes, and one article on words people use to describe Halloween and their favorite/least-favorite candies. The code used for this project is hosted at https://github.com/mcandocia/halloween_survey. When do kids stop believing in Santa? 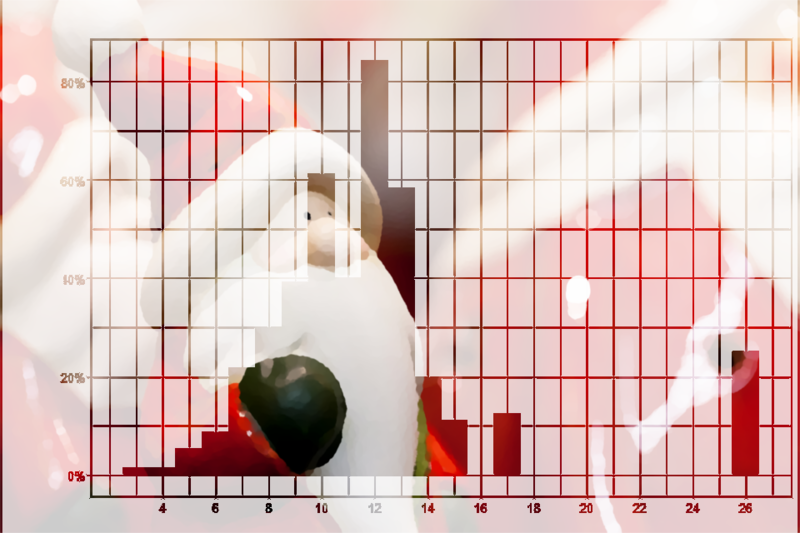 Are there any backgrounds more at risk for not believing in Santa as long? I explore these questions using a Christmas survey in part 2 of my series of Christmas articles.